We appreciate you choosing Beans & Butter Coffeehouse for your event! This contract is for General Event Rentals. Weddings have different rates and are covered in a separate agreement. We are only able to accommodate Rentals and Events after 6:00pm. If you would like to confirm for a different time please contact Olivia Simmons. We do not reserve tables for groups that are not renting the space. If you are just looking for a space where 12 or less customers can gather, simply arrive early and stake out a few tables. We cannot guarantee available seating for your gathering of 12 or less at any given time. If you wish to gather with more than 12 people, you must rent space. If you wish to make presentations, project images, play amplified sound, or deliver lengthy speeches, you must rent space. The rate for rental of the space is $125.00 per hour with a 3 Hour minimum and a $100.00 deposit is required to secure date, time, expected guests and is applicable to your total rental. Beans & Butter Coffeehouse will be closed to the public during your event. If your rental time extends past contracted time, you will be billed at $150 per hour. Facility: The legal limit for public inside our facility is 45 however, this does not include seating outside. The rental includes the front of the house 6 tables, 12 chairs, 1 community table, in addition to one couch and bathroom. Use of our kitchen, counter area, ice machine, oven and appliances are not available. Full Shop HOLIDAY: Rental hours on major holidays. RATE – $200.00 per hour. 3 HOUR MINIMUM. Only available after 6:00pm. 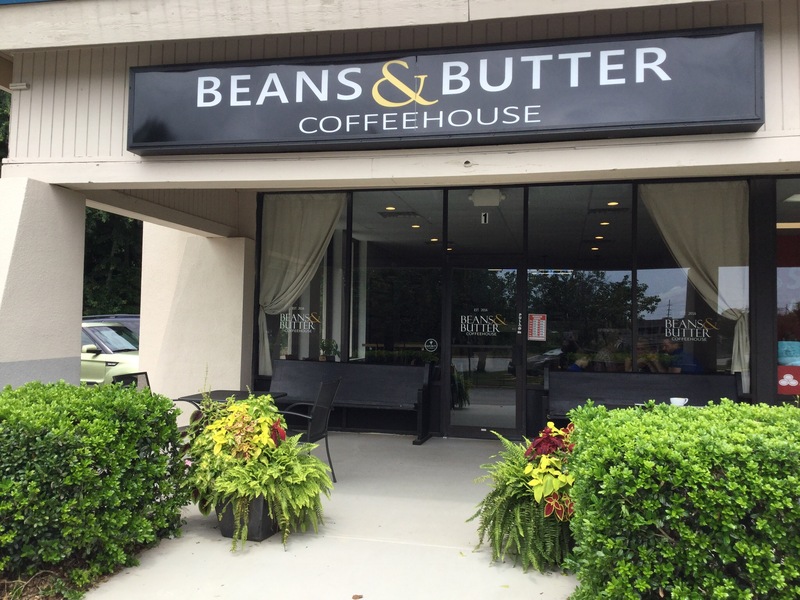 Full Day: Beans & Butter Coffeehouse will close to public for the entire business day – 7:30am until 6:00pm. Rate – $2,000.00. Staff Costs: If you do not wish to have Beans & Butter provide food service for your guests, 1 staff member is required as chaperone for your event at $10/hour for the duration of your event. If you choose additional food services provided, additional staff may be necessary to assist in providing additional support. These additions will be covered in the food contract. We are not permitted to serve any alcoholic beverage however, it is only permitted if you hire a licensed bartender for your event and we will require advance notice. All rentals REQUIRE a credit card number to be placed on file. This policy is in place in case of damage caused by rental client’s event to Beans & Butter Coffeehouse spaces, property, artwork and / or staff. This credit card will NOT be charged EXCEPT in cases of damage to Beans & Butter Coffeehouse’s spaces, property, artwork and / or staff or in the case of a violation of rental policy by rental client. The sound system can be utilized or turned off for your event. We do not have lighting equipment, playback systems or microphones available. Our parking lot should be ample for your guests and parking will be marked off for your guests. We do not provide security guards for events. In the event of inclement weather on the day of your event, we are happy to work with you to reschedule for another day. If you choose not to reschedule, 50% of your rental deposit ($50.00) will be refunded. Cancellations: We understand that there’s always situations that arise and will require a change of plans. Please contact us as soon as possible in the event of a change request. We will work with you to ensure that you are accommodated. But, in some situations payments cannot be refunded.